they may ponder over its verses, and that men of understanding may remember." [Sād:29]. It is known that anyone who does not busy himself with contemplation of the Great Qur’ān, i.e. 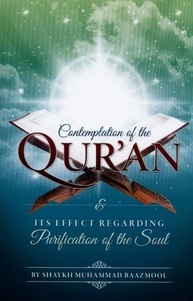 reading it, understanding it, appreciating it's meanings, and acting on it, then he is in opposition to the Qur’ān, not a contemplator of it, and therefore deserving of the disapproval and scolding mentioned in the verses, as Allāh gave him understanding in order that he may be able to contemplate the Qur’ān.